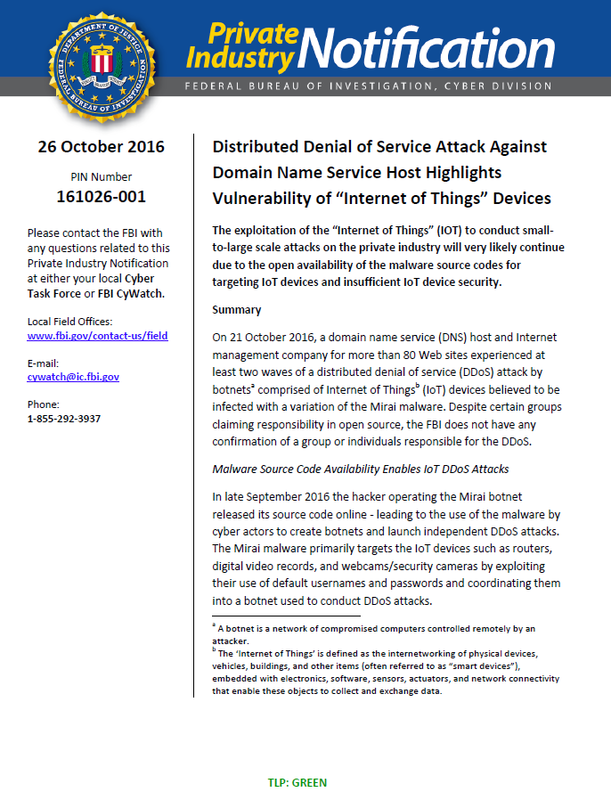 On 21 October 2016, a domain name service (DNS) host and Internet management company for more than 80 Web sites experienced at least two waves of a distributed denial of service (DDoS) attack by botnets comprised of Internet of Things (IoT) devices believed to be infected with a variation of the Mirai malware. Despite certain groups claiming responsibility in open source, the FBI does not have any confirmation of a group or individuals responsible for the DDoS. In late September 2016 the hacker operating the Mirai botnet released its source code online – leading to the use of the malware by cyber actors to create botnets and launch independent DDoS attacks. The Mirai malware primarily targets the IoT devices such as routers, digital video records, and webcams/security cameras by exploiting their use of default usernames and passwords and coordinating them into a botnet used to conduct DDoS attacks. Recent reporting demonstrates that botnets comprised of IoT devices can be used to conduct unprecedented and powerful attacks that can take down Web sites. Additionally, in September 2016, two of the largest IoT DDoS attacks using the same malware disrupted the operations of a gaming server and computer security blogger Web site. Computer security researchers over the past several months have identified dozens of new malware variants targeting Linux operating systems. The emergence of malware targeting Linux devices is likely based on the large number of mobile and IoT devices running exclusively on the Linux operating system. Most of the Linux malware variants scan the Internet for IoT devices that accept Telnet, which is used to log into a device remotely, and try to connect to vulnerable devices by using brute force attacks with common default login credentials.